The pivotal moment of a security video which captured Alexander Goldinsky's allegedly faked fall in Woodbridge, New Jersey. Goldinsky is charged with insurance fraud. 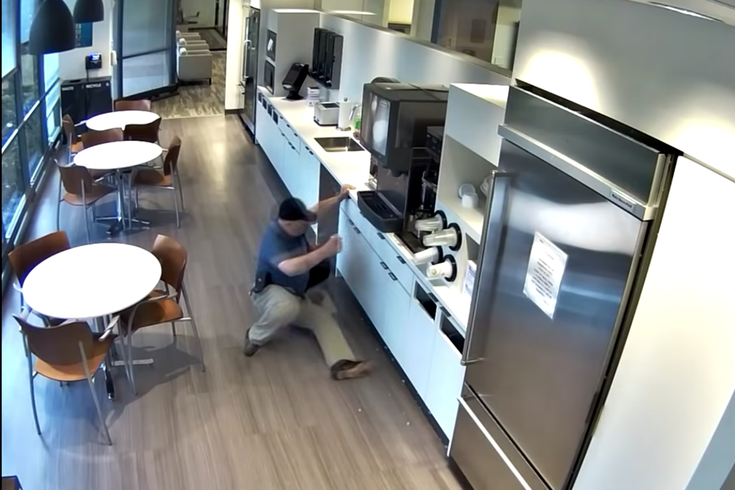 Last week, a New Jersey man was seemingly caught in a lie when new video surfaced of him faking an injury in a workplace break room in Woodbridge. Alexander Goldinsky, 57, of Randolph had filed an insurance claim last fall for ambulance service and treatment at a local hospital, when the incident occurred. A security video released on Jan. 31, however, allegedly shows he had faked the fall. The video has since gone viral. And yet on Thursday, Goldinsky pleaded not guilty in Superior Court to charges of insurance fraud and theft by deception, according to ABC7. Goldinsky was arrested on Jan. 15 and released on a summons. At the 0:11 mark of the video, Goldinsky seemingly is seen tossing ice from a soda machine onto the ground. Then, at the 0:26 mark, Goldinsky lowers himself to the ground while bracing himself with the counter, and then splays backwards. Goldinsky was a subcontractor working in Woodbridge on the day of the incident, according to NJ.com.